UC swimmer Enna Selmanovic was able to still go about her day with colored glasses while recovering from a concussion. A University of Cincinnati neurologist has discovered colored glasses effectively calm the brain down after a concussion and provide relief for the patient. Joe Clark, PhD, professor in the Department of Neurology and Rehabilitation Medicine at the UC College of Medicine says, "While sunglasses can provide some relief, they are not very practical indoors or in low light environments." He found 85 percent of people had relief with blue, green, red and purple glasses and reported no adverse effects. Near the football field at Higher Ground is a makeshift concussion diagnosis and treatment center. 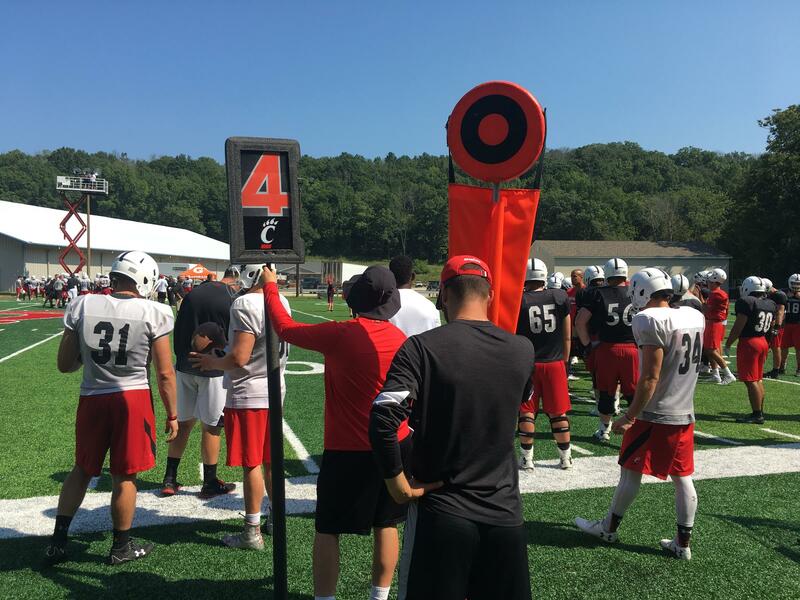 The glasses were in use at UC's preseason football camp in West Harrison, Indiana. 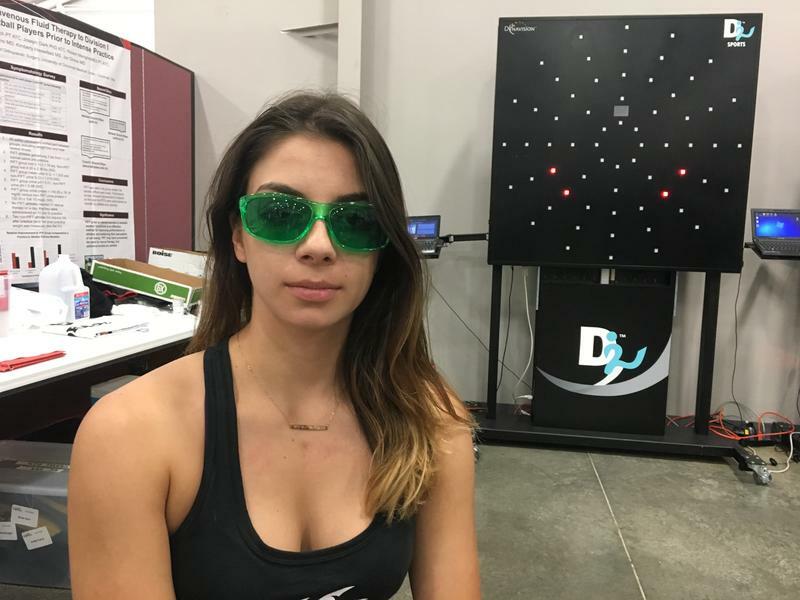 One concussion sufferer was able to do cardio and strength conditioning with colored glasses. He was on the sidelines riding a bike. Swimmer Enna Selmanovic fell out of bed and got a concussion. She was extremely sensitive to light and couldn't keep her eyes open. "I wore a teal color," Selmanovic says. "It definitely helped me. It was kind of a like a soothing experience. We tried on red and green. I remember crying because it hurt so bad. But the blue definitely helped." Joe Clark points out a computer program that scientifically pinpoints which glasses a concussion sufferer should wear. Besides trial and error of trying them on, Clark says he has a computer program that can scientifically determine which color the brain needs. "Mentally picture black and red - that's no colors and the color red. So, if I flash black and red at you and on a computer screen and your brain lights up, then I'm knowing that red is not good for you." The UC research, published in the Journal of Athletic Training, is free and open to the public. Contact Joe Clark for more information. Nearly four million Americans sustain a concussion or traumatic brain injury every year. 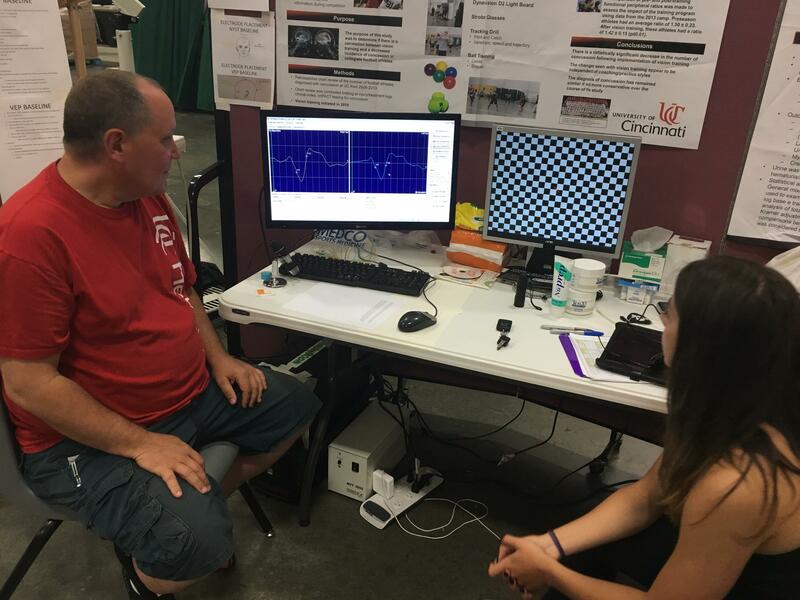 Research from Cincinnati Children's Medical Center and the Ohio State University Wexner Medical Center shows teens who used a mobile health app once a day in conjunction with medical care to treat their concussion got better faster than if they did with standard treatment alone.